There was some momentous climate news this weekend, yet it slipped under the radar and was barely noticed by the popular media. An agreement was signed that will eradicate one of the most potent greenhouse gasses in the world. At a UN-sponsored Montreal Protocol meeting in Kigali, Rwanda, 197 nations came to a legally binding agreement to phase down hydrofluorocarbons or HFCs. 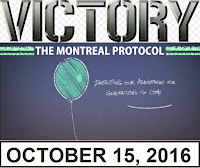 Many years before the Paris Climate Agreement in 2015, the Montreal Protocol was a global deal to eliminate chlorofluorocarbons (CFCs), also known as Freon. These chemicals were found to be eating away at the ozone layer. CFCs and the HFCs that replaced them are used in fridges and air conditioners. The eradication of CFCs was an environmental success story that is allowing the ozone layer to recover. However, we then realized that HFCs are a powerful climate pollutant. According to the IPCC, halocarbons like CFCs and HFCs are responsible for about 8 percent of humanity’s total global warming impact. As reported by Jessica Lyons Hardcastle in an Environmental Leader article, HFCs are up to 10,000 times more potent than carbon dioxide. According to the Environmental Investigation Agency (EIA), this is "the most important climate meeting of 2016." The amendment could avert as much as 100 billion metric tons of greenhouse gas emissions by 2050. The Institute for Governance and Sustainable Development says the new agreement can prevent as much as one Fahrenheit (half a degree Celsius) of warming. In 2015 WRI published a report that recommended reducing our use of HFCs. One of the key findings in the report indicated "The US can reduce HFC emissions by over 40 percent from what would otherwise be emitted in 2030 at a negative or break-even price today." There are many corporations that came together in support of this outcome. A White House initiative built a coalition of hundreds of companies that have already committed to phasing out HFC refrigerants. The 400 members that compose the Consumer Goods Forum, include notables like Unilever, Nestlé, Anheuser-Busch PepsiCo, Coca-Cola, Target, DuPont, and Honeywell. Early in October, they agreed to phase out HFCs and they called on all consumer goods companies to do the same. The agreement in 2016 was presaged by a resolution in 2010, which agreed to explore low-carbon technologies to replace HFCs. Companies have been working on replacing HFCs, in 2010 General Motors came out with a more climate-friendly replacement. In a Vox article, Brad Plumer described the phasing out of HFCs as a "crucial" step to combat climate change. He went on to say "this was one of the single biggest measures ever taken to address global warming." 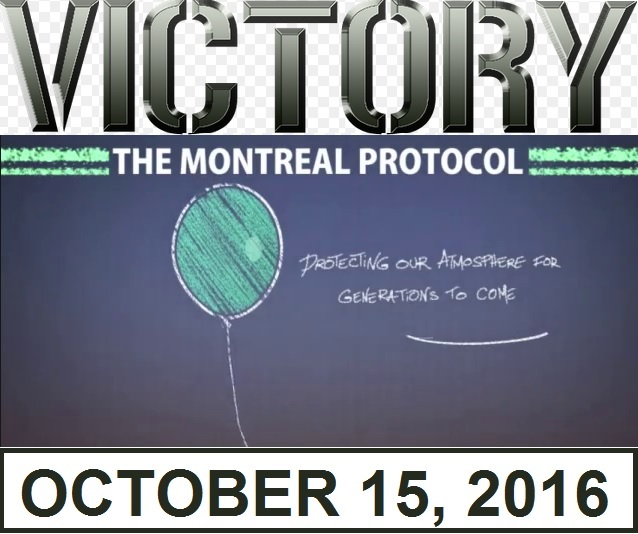 Under the new Montreal Protocol agreement, wealthy nations like the US must start cutting HFC use by 2019. Developing countries must cap their HFC use by 2024 and they will receive aid to help them transition. The WRI estimates that the deal could cut global HFC use up to 85 percent by 2047. There are now newer refrigerants that do not damage the ozone layer and are far less harmful climate pollutants. One of those new refrigerants is called HFOs or hydrofluoroolefins. However these refrigerants are more expensive, hence the financial support for developing nations to help them transition away from HFCs. “HFCs have been the fastest growing climate pollutant in the US, and phasing them down globally would provide the biggest single piece of climate mitigation available to the world today,” said Durwood Zaelke, President of the Institute for Governance & Sustainable Development. In the US, the biggest HFC target is the car market, where up to half of the HFCs are used in car air conditioning systems. General Motors is already shifting to climate-friendly alternatives like HFOs. American President Barack Obama called the deal, "an ambitious and far-reaching solution to this looming crisis."